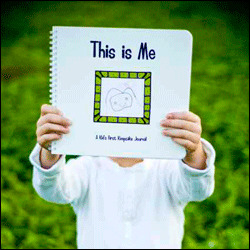 recently i came across a the this is me journal - a kid's first keepsake journal. carrie (the visionary, creator & extraordinaire of the this is me journal) spent forever searching high & low for the perfect "first journal". she really wanted something similar to what she had as a kid... something for her "little ones" to record their thoughts & drawings. having no success in locating said journal, she created one & then decided to self-publish (wow!). resulting in the this is me journal... the perfect combination of "drawing, writing, creativity & simple scrap booking to capture the years memories through your child's eyes". check out the shop HERE, all the wonderful details & features of the journal, and read up on carrie's journaling tips & hints. also be sure to check out my favorite... the kids' self-portrait gallery.